I’ve finally managed to complete April’s Sweetling, inspired by a mini course from our old friend, Effy. A Sweetling is a paper doll made on water colour paper and dressed in painted papers or scrapbook papers. 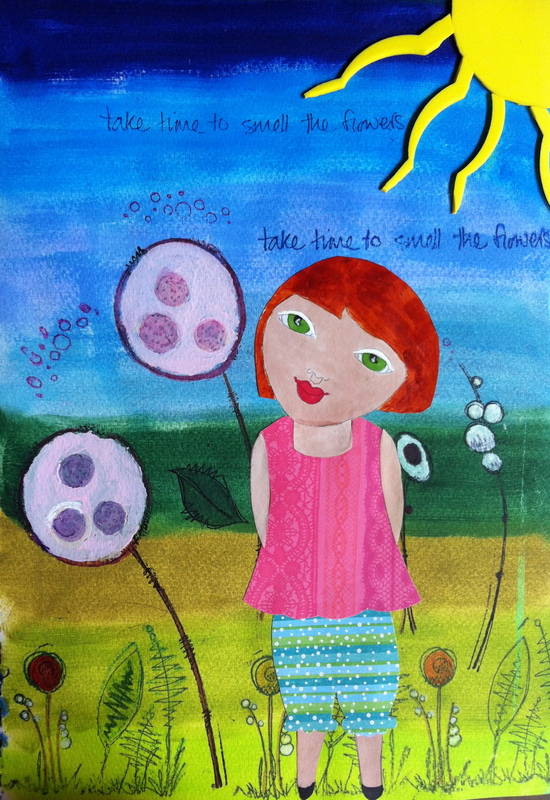 The sentiment for this Sweetling is “Take the Time to Smell the Flowers”. It took a couple of days, with much help from Andrea – who says she’s rubbish at art but has actually owned a jewellery shop and has a sister who does own an art shop in Hungary. So art clearly does run in the family! I must’ve had something Spring-like on the brain because I’m going with sunshine and nature in this piece. The flowers and foliage are courtesy of stamps from Leandra at PaperArtsy. I chose the sentiment “Take the time to smell the flowers” because I thought we all need to slow down and take the time, from time to time. The sun is cut from foam and has a nice flourescent glow to it. The blue and green background is Nicholsons watercolours. The Sweetling’s costume is from a bunch of old papers I’ve been storing up for the occasion. Husband says the Sweetling looks like Edna Mode from The Incredibles or Hetty from NCIS. You choose. Effy says there will be another Sweetlings mini in June, so sign up now.